The “walls” of the light box reflect the light source, and making it bigger, however the light quality is a bit harsher than the light tent, especially if you are using a semi reflective material such as foamboard. Light boxes are also commonly used with worklights, which are a personal fav of mine due to their low cost.We had a light box featured on DIYP, in the very early days of the blog. It was a wooden large model that took your relationship with your significant other half the living room. 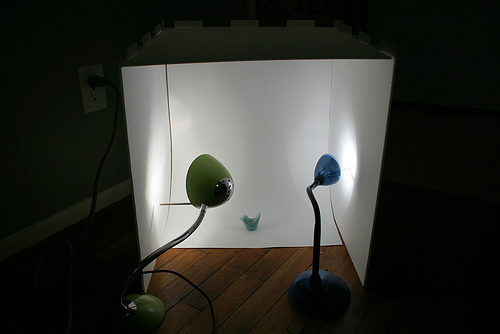 So how about this light box from Amy Kingman: It is big enough to accommodate 2-3 worklights. 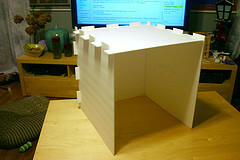 It is made from foamboard (cheap, cheap, cheap) and nicely folds away for easy storage. Oh, and here comes the good news, it takes only an exacto knife and 10 minutes to build one of those. See full instructions and samples at Drawings In Motion and an improved version (with with fluffy backdrop) here.